Due to the increased availability of both neuroscience methods and theories, Information Systems (IS) scholars have begun to investigate the potential of neuroscience for IS research. This new field of research is referred to as NeuroIS. Moreover, large technology companies (e.g., Microsoft and Philips) started research programs to evaluate the potential of neuroscience for their business. 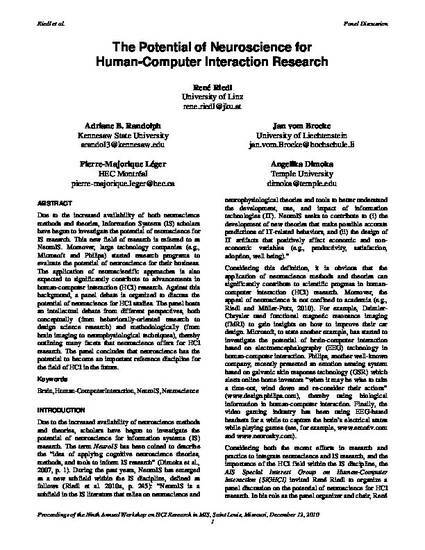 The application of neuroscientific approaches is also expected to significantly contribute to advancements in human-computer interaction (HCI) research. Against this background, a panel debate is organized to discuss the potential of neuroscience for HCI studies. The panel hosts an intellectual debate from different perspectives, both conceptually (from behaviorally-oriented research to design science research) and methodologically (from brain imaging to neurophysiological techniques), thereby outlining many facets that neuroscience offers for HCI research. The panel concludes that neuroscience has the potential to become an important reference discipline for the field of HCI in the future.